I bet you’d LIKE to cut down on all those sugar filled beverages you consume? ‘BUT WATER IS SO BORING AND TASTELESS’ I HEAR YOU ALL SAY. Well it doesn’t have to be . . . Try fruit infused water, it is a great alternative! The process is really simple, straightforward and can be easily prepared. Most importantly, it is an extremely healthy option. Dehydration is known to be linked to headaches, digestive problems, obesity and joint pain. 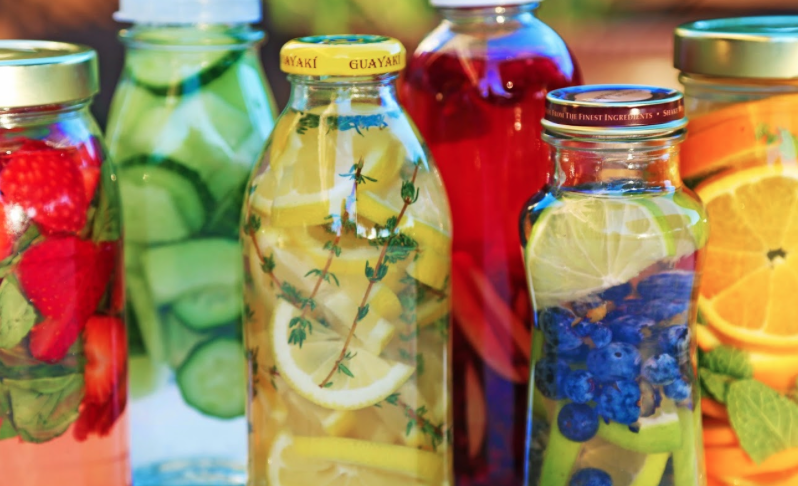 Infusing your water with fruits and herbs not only improves the flavour, but also adds essential vitamins that help your body. The store bought vitamin water is less cost friendly and far less healthy. They often have preservatives, artificial sweeteners and colours, sodium, and high fructose corn syrup or refined sugars. SO DON’T BE FOOLED! SO ALL YOU NEED TO DO IS THROW (OR SIMPLY PLACE AS ‘THROWING’ COULD BE MESSY) SOME SLICED FRUIT INTO A LARGE JAR OR CONTAINER, FILL WITH WATER, STICK IN YOUR REFRIGERATOR OVERNIGHT AND BOOM!